Today I ordered a Bradley 4 rack smoker from Amazon. I have a gift card to Bass Pro Shops (thanks Mom and Dad) so I a going to buy the large sampler pack of pucks there. Looking forward to lots of ribs, brisket and sausage. I have recently undertaken a journey of cooking*. 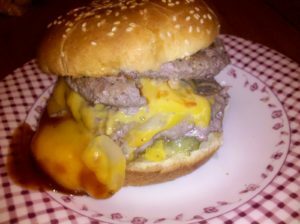 What started out as complaining about the price of ground beef (ridiculous), has turned into an obsession over cooking the perfect burger. This is one of my better results. I’ll probably make a few more posts as time progresses about the equipment that I’m using, but suffice it to say that this was one delicious burger. Special thanks to my buddy Joe for the delicious homemade pickles. *Despite a few more posts, I promise not to turn this into a foodie blog. If you like that sort of thing, check out A Hamburger Today, which I blame entirely for my obsession. Today I was given an air compressor at work for free. The only catch was that it didn’t turn on and had a broken wheel. A quick clean of the contacts on the power switch and it turned on. Instead of replacing the wheel we decided to fix it. 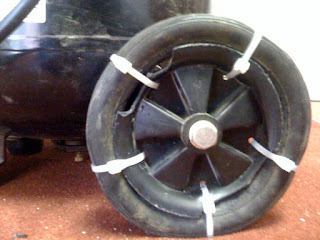 Five holes and five zip ties later and we had a wheel that was as good as new. Now all I have to figure out is why it doesn’t automatically turn off until the safety valve blows.